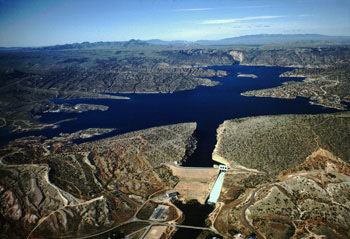 Alcova Dam and Reservoir provides irrigation for ranching and includes a power plant. Wyoming has a rich history in energy. Through our partnership with the Wyoming State Historical Society, we are highlighting our past each week. Alcova Dam and Reservoir is located approximately 30 miles southwest of Casper, Wyo. Construction began in August 1935 and was completed in 1937. Today it provides irrigation for ranching and includes a power plant with two generators construction in 1955. The power plant provides 88.8 kilowatt hours of electricity to central Wyoming.